For the Ceiba Tree Park in Ponce, Puerto Rico, see Parque de la Ceiba. In 1872 Manuel Hernández built a small shack under the Ceiba tree that was at one point by the old docks. Over time, more and more people from all over present-day Honduras (especially the departments of Olancho and Santa Barbara), and from around the world settled in La Ceiba. These people were attracted by the cultivation of bananas that became popular in the region. In the late 19th century, the banana business caught the attention of big North American banana companies such as the Vaccaro Brothers' Standard Fruit Company from New Orleans. This new economic activity attracted national and international immigrants to La Ceiba. The current neighbourhood known as Barrio Inglés was the first recognised neighbourhood in the city and was named so because of the number of English speaking people living in the barrio. At that point the main thoroughfare of La Ceiba was present-day Avenida La Republica, which is where the train tracks were set. These train tracks were built by the Standard Fruit Company (now Standard Fruit de Honduras, a Dole subsidiary). This company was largely responsible for the early growth of the city. Fábrica de Manteca y Jabón Atlántida, known as La Blanquita, at one point, the largest producer of consumer goods in Honduras, now defunct. Mazapan School, the first bilingual school of the nation, the oldest high school and second oldest elementary school in the city. The first municipal building or city hall was located in the corner of 2da Calle and Avenida Atlántida, where the present day Ferretería Kawas warehouse was. The building was made of wood and in 1903 it was burnt down due to vandalism from people wanting to get rid of private property ownership records in La Ceiba. The municipal building was again set on fire on 7 March 1914. The Municipal Corporation moved the offices more south of the city where it was again set on fire in 1924. It was shortly built in its current location, a piece of land donated by Manuel Mejía. La Ceiba features a trade-wind tropical rainforest climate (Köppen Af), with substantial rainfall throughout the course of the year, though due to the northerly aspect there is a peak between October and February when the trade winds are strongest and extreme orographic rainfalls occur. The average annual rainfall is about 3,200 millimetres (130 in), making it one of the wettest cities in Central America, second only to Colón, Panama among urbanised areas with more than 100,000 people. Among Honduran cities, La Ceiba is the second most important port town after Puerto Cortés. Its economy is made up of mostly commerce and agriculture. Pineapple is the city's major export. Its largest producer is the Standard Fruit Company, a subsidiary of the Dole Food Company, which operates throughout northern Honduras and is based in La Ceiba. Tourism also plays a large role in the city's economy (see below). Since its development in the late 20th century, the La Ceiba seaport has played an ever-increasing role in the economy of the city. Currently, this port represents a vital economic artery to La Ceiba's growing tourist industry. Additionally, the La Ceiba sea port is home to one of the finest boatyards in the north west Caribbean (According to "Western Caribbean Cruising Guidebook"). Known as the La Ceiba Shipyard, this company offers a complete group of marine services for all types of seagoing vessels. La Ceiba is home to many public schools, among the largest is Escuela Francisco Morazán along Avenida San Isidro, which is considered the main street of the city. Instituto Manuel Bonilla is the largest public High School in the City with over 5,000 registered students. There are also many private schools in La Ceiba. It is also home to many other private bilingual education schools, which offer education in both Spanish and English. Most of these offer a Honduran Bachillerato Diploma (equivalent of High school diploma), while Mazapan School offers a US accredited High School diploma as well. These schools usually offer grades 1 – 11/12 with some offering pre-school education. The first university in the city was the Centro Universitario Regional del Litoral Atlántico (often called CURLA), which is a Public university run by the larger Universidad Nacional Autonoma de Honduras (UNAH). The first private university to open in the city was Universidad Tecnológica de Honduras(UTH), which opened in 1995. At the time the college only offered night classes, using the classrooms in a local private high school. In 2002 the college built their own campus. 2002 also marked the opening of the Universidad Católica de Honduras, run by the Catholic church. Additionally, development of a new campus in La Ceiba for the Universidad Tecnológica Centroamericana – UNITEC is currently under way as of 2008. La Ceiba has long been known as the tourism capital of Honduras, due to its proximity to the beach, active night life, and a variety of parks and recreational areas in and around the city. Another factor contributing to the city's tourism is the city port which provides ferry services to the Bay Islands/Islas de la Bahia in the Caribbean. Ferries from this port offer daily service to the main islands of Útila and Roatán. The area around La Ceiba has many parks and natural reserves. Its most recognised natural area is the Pico Bonito (Beautiful Peak) National park. This park's most recognised feature, Pico Bonito on the Nombre de Dios mountain range, is 2435 meters high and provides a back drop for the city. The Cangrejal River, popular for its Class III-IV river rafting, borders the eastern edge of the city and the Cuero and Salado Wildlife refuges with its wild manatees is located a few miles to the west of the city. Semana Santa (Holy Week) is one of the city's busiest tourist seasons. During this week tourists from all over the country flock to the city to enjoy its sun, beach, and very active night life during that week. The busiest tourist season by far is the week leading up to the internationally renowned "Gran Carnaval Internacional de La Ceiba" which is a citywide celebration in honour of the city's patron saint, St. Isidore (San Isidro). During the week leading up to the third Saturday in May, many neighbourhoods will have their smaller celebrations in one or a couple of their streets. On Saturday afternoon the big parade with elaborate floats takes place along Avenida San Isidro, the city's main thoroughfare. After the parade the locals and tourists all have a celebration along that same road, where there are stands that sell food, beer, drinks, and souvenirs. There were trains running through La Ceiba to bring the bananas from the plantations but they are not active any longer although traces of the old railroad tracks can still be seen. Nowadays a 3 km-long city rail line still works and, in the nearby village of La Unión, it exists a short tourist railway to Cuero y Salado National Park. Buses and taxis make up most of the public transportation in the city, with numerous buses serving almost every available route in the city. Taxi-cabs are numerous in the city, costing as little as L.25.00 (just over $1.25 as of 2013) for destinations within the city limits. The pier to the east of the city offers transportation via ferry to 2 of the 3 major islands that make up Islas de la Bahia; Roatan and Utila. 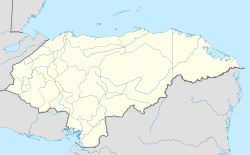 The Golosón International Airport to the west of town offers flights to the other major cities in the country as well as other towns in the Mosquitia Region of Honduras in the east. This airport is hub to Aerolíneas Sosa. There is also a bus station just west of the city centre though some buses also run from their own terminals. La Ceiba is the home of two clubs of the Honduran National Professional Football League, Victoria and Vida, both playing in Nilmo Edwards Stadium. The matches between the two rival clubs are known as Clásico Ceibeño. In Paul Theroux's novel The Mosquito Coast, Allie Fox, disillusioned with America's materialistic culture, abandons his native country and emigrates with his family to Honduras, initially disembarking at the city of La Ceiba before making his way inland with a vision of starting a new life. ^ "Honduras: metropolitan areas". World Gazeteer. Archived from the original on 2 March 2012. Retrieved 24 February 2010. ^ "La Ceiba Climate Normals 1961-1990". National Oceanic and Atmospheric Administration. Retrieved 24 January 2016. ^ "Klimatafel von La Ceiba, Bez. Atlántida / Honduras" (PDF). Baseline climate means (1961-1990) from stations all over the world (in German). Deutscher Wetterdienst. Retrieved 24 January 2016. ^ "Station Goloson" (in French). Meteo Climat. Retrieved 12 June 2016. Wikimedia Commons has media related to La Ceiba.